People have always admired Caemon’s eyelashes. They are impossibly long and full and frame his beautiful eyes so perfectly. A few days ago, when we were discussing just whether or not he would lose his lashes and brows this time with one of the nurses, she described his lashes as “spindly.” I was a little surprised, and then I looked and noticed that they have, in fact, become rather sparse. There was no need to question. The lashes were already falling out. Today, when Caemon awoke from his nap, I saw four or five lashes scattered over his face. As he laid there rubbing his eyes, off came a few more. Jodi and I took turns picking them up and blowing them off of our hands as we wished what mothers wish when their children are stuck in hospital beds. We are wrapping up Day -3. For a couple of days now, Caemon has been receiving new chemotherapy drugs along with something called ATG (thymoglobulin). It is a substance that acts as an immunosuppressant, which will keep Caemon’s body from rejecting the donor marrow. As you can imagine, it is quite rough on the body; it is also highly likely to cause allergic reactions. Caemon has to be premedicated with antihistimines, steroids, and Tylenol to minimize these reactions, but just in case, just outside his door is an emergency stash of things like epinephrine, extra hydrocortisone, more Benadryl. Seeing these any time we enter or exit his room reminds us just how precariously we are living now. At the same time, we know these nurses and doctors have got this under control. Our poor boy has been on a couple of different steroids for the past two days, and they make life so hard for him, causing him to be crabby and disagreeable for the majority of the day.Even so, he has managed to seem mostly himself until today. Today he awoke wanting to do little more than watch videos, and this was true most of the day. We pulled out various toys, but he felt lousy and wanted the comfort of the same five Berenstain Bears episodes over and over again. As much as Jodi and I used to limit his screen time, we are finding it helpful here to let him escape his reality a little and get through the harder days with more ease. The day culminated in Caemon feeling worse and worse and finally spiking a fever. Although the fever has gone down on its own, and the ATG commonly causes kids to spike fevers, the standard protocol here is to draw blood cultures to make sure there are no infections lurking, and then they’ll start an antibiotic as well. We have been down this road before, so while it is upsetting to see our son feeling so awful, we also know this is one of the rites of passage on his way to wellness. This process is supposed to have its complications. The body is supposed to dislike losing its immune system and healthy functioning cells. This doesn’t take all the worry away, but it can be reassuring to know that Caemon’s body is responding as it should. Caemon’s transplant is Thursday. It is hard to believe just how quickly this day has come, and we find ourselves feeling both hopeful and nervous about it. This is already a rough road, and we know it only gets harder from here. Still, we have plenty of distractions to keep us from sitting in too much anxiety. Today it was a visit from Santa and making eyelash wishes. Given that this is the season for miracles, we will welcome them any way we can. Our first Santa sighting through Caemon’s window. We were even able to open the door and have a moment with Santa. This entry was posted in BMT, chemo, transplant on December 18, 2012 by T.
Leaving for BMT (with his medical kit, of course). We have made our return to the hospital, and this time, we managed to be gone until the morning we were due back, which is not the usual for us! It was hard to return after such a short and lovely time at home, but once here, we got down to the business of BMT. We have been talking about Caemon about life beyond the double doors quite a bit lately. You see, the children’s oncology unit is a pair of hallways that both end at a set of double doors. Beyond the set of double doors is the bone marrow transplant unit. Caemon has known about the double doors for some time but had never seen behind them until just before we left when he had his first glimpse. He knew there were things to look forward to here, so once he moved past the difficulty of leaving home again, he began to anticipate his new experience behind the double doors. He knows it is special here, and so far, we have worked to make it even more so by putting up special decorations (many lights and even large tree decals on the walls to give the feel of a forest), giving him some special gifts, and helping him become acquainted with the new rules here (moms can’t eat in the room, a bath must be had every day, no more disconnecting from the IV pole or leaving the room, etc.). I would like to share more about this when I am less tired, but today has been a series of adjustments for us all, and I imagine we will continue to learn how to live life beyond these double doors. Playing with a special gift. 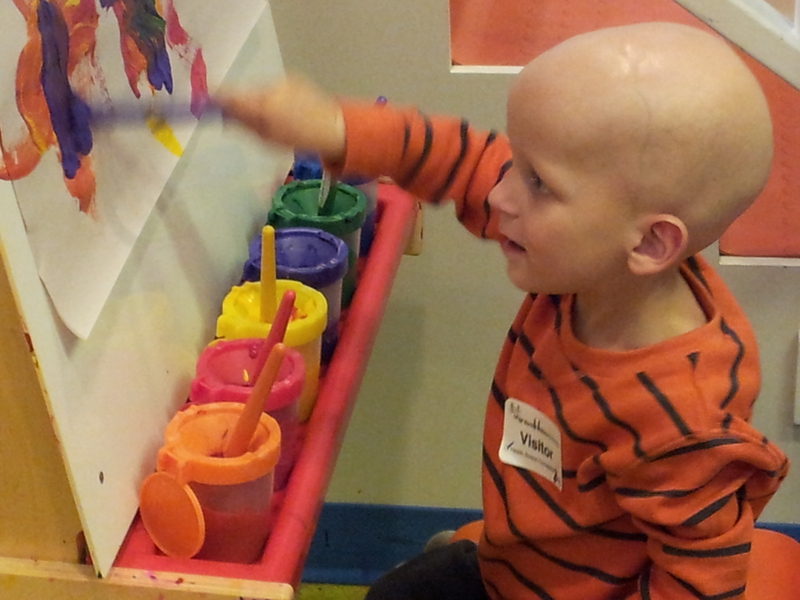 Tonight, Caemon is receiving the first of his conditioning chemotherapies. He has already had one dose along with the drug Attivan, which is meant to prevent seizures (one of the side effects of this particular chemotherapy), but which can cause children to either become relaxed and happy or out of their minds and a bit wild. We were fortunate to see the first reaction and not the second tonight, so we are pleased about this. We all need our rest. Because this is the first day of Caemon’s chemotherapy, or “conditioning,” it is called “Day -10.” We are counting down to Day Zero, which will be the date of transplant. We are told this will be December 20th (on the eve of the Winter Solstice). Beyond the transplant date, we will count days as +1, +2, and so on. Such is the way beyond the double doors. As far as we know, our donor is having her surgery to harvest her bone marrow this week. I don’t know the exact day, but my best guess is that it will be the twelfth. Those cells will then be frozen in anticipation of Caemon’s transplant on the 20th. So here we go. We’re on our way up the mountain. More to come later. This entry was posted in BMT, chemo on December 11, 2012 by T.
We are in about Day 23 of Caemon’s most recent round of chemo. His treatment stopped on Day 8, so for the past two weeks or so we have been waiting for his counts to drop and then climb. They have started to inch up bit by bit. His platelets seem to recover most quickly, so they are on the rise, as are a couple of other counts. However, the cells that everyone is watching now are the neutrophils, and they are taking their time. Our doctor reminded us last week that he didn’t recover until Day 28 last time, so he is right on track. Why does this matter so much? If Caemon’s counts recover, and if his neutrophils reach a “safe” level, we will get to go home for a few days before we are admitted for transplant. We all need this reset desperately, but our boy particularly needs some time free from tubes and beeps and a hospital bed. This next admission–the big event–is going to require him to be confined to his room for the duration of his stay. There will be no more playroom or wandering the halls to visit the nurses. This will be hard on our boy who loves seeing his surroundings, which is why it is so important that we have a few days of relative freedom. 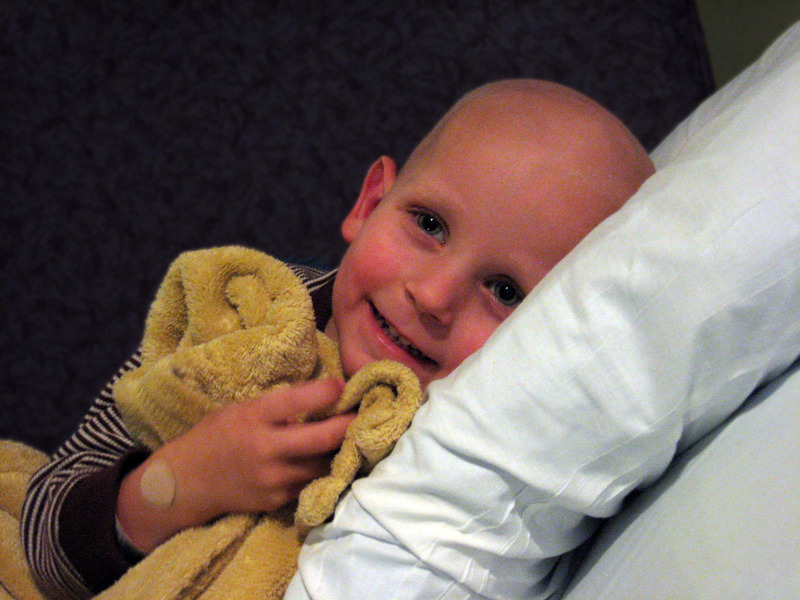 In just nine short days, Caemon is going to be admitted as a bone marrow transplant patient. His conditioning regiment of chemo will begin, and will begin this process of taking the ultimate step toward saving his life and beating this disease. This entry was posted in blood counts, chemo, transplant on November 25, 2012 by T.
Over a week has passed since I last wrote an update. Time in the hospital follows a very different chronology than the rest of the world. Days and weeks blend together. Weekends come and go without much of any awareness, other than that Caemon has his weekend meds, and there are fewer people needing to check in on him. Since I last wrote, Caemon has finished his chemotherapy. He is five days out from his last dose, and his counts have fallen as expected. Today, his neutrophils are at zero, which is called “nadir.” Now we wait for the counts to begin to recover. We are hoping for a chance to go home before transplant. It may just be a couple of days, but any sort of reset will be nice. Caemon handled this round of chemo very well. He had a few fevers, but nothing long-term, and he had a bit of a rash from one of the drugs, but that too was manageable. It has been overwhelmingly clear what a difference it makes for him to undergo these treatments with less disease in his body. The fact that it seems to continue to work is heartening. At this point, our biggest goals are to keep Caemon free of infection and to keep his spirits up. Our nurses are doing a wonderful job of making sure he has a certain number of hours each day when he is free of his IV pole. He looks forward to being hep-locked for his trips to private neutropenic play time in the hospital’s playroom. This playtime offers such great reprieve from the tiny hospital room, and it lets him branch out and explore a bit more, especially without an awkward IV pole attached to him. While initially he only wanted to play with medical supplies there, he now has branched out to playing with cars, crafting with glue and other fun supplies, and even painting. He also enjoys a daily visit to a patio near the playroom–sort of a rooftop deck in the middle of a couple of wings of the hospital. It’s nice that he can see the sky, breathe a little fresh air, and remember what it feels like simply to be outdoors. He never stays for long, but I know he finds it refreshing. We all particularly enjoy having Caemon free of his tubes because it increases snuggle time, and our boy is very fond of this. Often in the evening, before he has to be hooked back up, we’ll curl up in the big chair together. These are sweet moments that feel just a little more normal than hospital bed cuddles. So much of what we do here is driven by our desire to make him comfortable, to provide him with a sense of normalcy, and for the most part, I think we have achieved a sense of home here in the hospital–as much of a sense of home as we’re all comfortable with anyway. Right now, though, we’re missing a very important part of that home equation, and that is Jodi. She has come down with a cold, and she has to stay away until she is no longer symptomatic. We all feel a little out of sorts without one of our little trio here, and although time does have a way of slipping by here in the hospital, my hunch is this is going to be a very long week. I will write more when time allows. Meanwhile, take a look at that smile. He’s still dreamy, bald head and all. This entry was posted in blood counts, chemo, hospital on November 16, 2012 by T.
Today, we finally met Caemon’s bone marrow doctor. He stopped by to meet Caemon and to bring us a bit of news. We have a donor, one with whom he is very pleased, and she is being “activated” (this means she is being called to her local center for testing and screening to determine her continued eligibility and availability). He told me she is a twenty-three-year-old woman, no kids, and he has high hopes that she is going to be an exceptional donor for Caemon. You may remember when I spoke about having twelve total markers on which a donor can be a match. This woman is an 11 out of 12, and for Caemon, this is perfect because in his case, we don’t want a 12 of 12, for the risk of recurrence is too great then. They have found our donor. Imagining an actual human being, a young woman who, if she is willing and able to go through this, is going to save our son’s life is humbling and beautiful. I learned her blood type. She is B-. 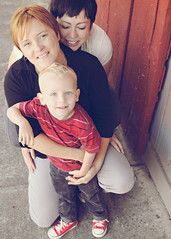 Caemon is O+, but after transplant, his blood type will change to B-. It just so happens that B- is Jodi’s blood type. He will have the same kind of blood as his Mama. That, for some reason, resonates beautifully with me. On top of having a person, we also have a date. December 3rd, we will be admitted to the bone marrow transplant (BMT) unit. The doctor predicts the transplant will happen on 12/12/12. Knowing all of this will happen in a month has me both terrified and hopeful. The doctors are all so pleased with Caemon’s response to his chemo that they seem to have a good deal of confidence about going forward. At the same time, this is not without a fair share of risk. It’s not without a difficult road of conditioning chemo, which will essentially destroy all of Caemon’s bone marrow and blood cells to make him receptive to the new marrow. He will be incredibly vulnerable to infection for quite some time, and that comes along with plenty of worry. However, we know the strength of this team. They are one of the best in the country, and that is no small matter. We can take comfort, too, in the fact that we will have the same nurses there as we have had here. It’s lovely to know we will be well cared for as a family, that Caemon will have familiar faces keeping him smiling during those long weeks of isolation. During his visit, the doctor asked Caemon when his birthdate was. When he learned this, he shared with us that Caemon’s is just a few days after his own. He told Caemon we would all need to have a big party for his fourth, gave me a broad grin, and made his way out. Yes, a big party will certainly be in order. Even though we have had this glimpse into our very near future, we’re also living very much in the present with Caemon’s current round of chemo. It won’t be quite as long–eight days instead of ten–but he is reacting more quickly to it. He has had a couple of fevers, is developing his rash in response to Ara-C (cytarabine), and his counts are dropping quickly. Today, he needed a blood transfusion, and soon he will be neutropenic again. We are told his counts will take a bit longer to recover this time because his bone marrow is tired, but they are hoping to send us home again before we’re admitted for bone marrow. I just can’t believe that we’re really this close. Then again, I can’t believe it’s November either. This entry was posted in blood counts, chemo, transplant on November 6, 2012 by T.